Height: males 25-27 in., females 23-25 in. 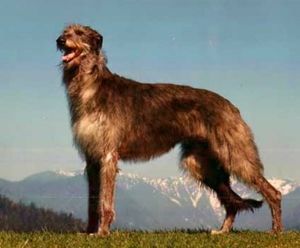 What is the origin of the Bloodhound? What does the Bloodhound look like? 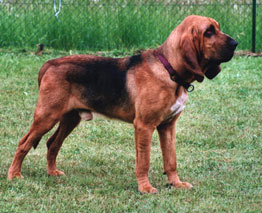 The Bloodhound is a powerful dog, 23-27 inches tall, weight 88-110 lbs. The head is very long with wrinkled skin on forehead, cheeks and neck. Nose is black. Lips are pendant. Eyes are dark hazel-brown. Ears are very long, set low and hanging. Talil is long, thick and tapering. 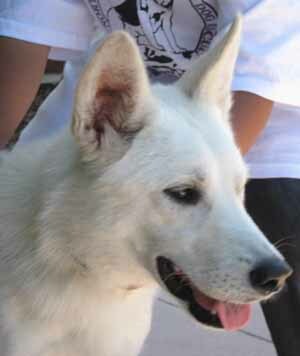 Coat is short and hard on the body, silky soft on head and ears. Colors are black and tan, liver and tan or solid red. 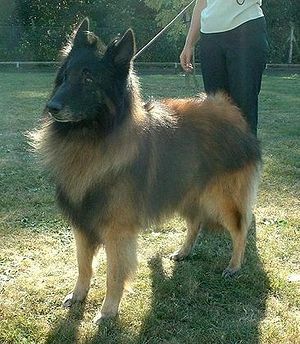 The coat needs occasional brushing. Face and neck wrinkles and ear tips require daily cleaning. What is the temperament of the Bloodhound? The Bloodhound is a gentle, good-natured dog. It is a wonderful pet with children. Bloodhounds are friendly towards other pets. They have an independent streak and once on the trail, are diffiuclt to recall. Not the easiest dog to train, but lots of patience and a firm, gentle hand will be rewarded. Early socialization will help avoid timidity. Some Bloodhounds are reserved with strangers. Bloodhounds require vigorous daily exercise and long walks but can live in an apartment. What is the Bloodhound used for? The Bloodhound is a tracking dog par excellence. Gifted with the finestr sense of smell, Bloodhounds can follow trails several days old and hold records for length and age of trails. Because of its gentle, affectionate nature, the Bloodhound is a great companion dog.